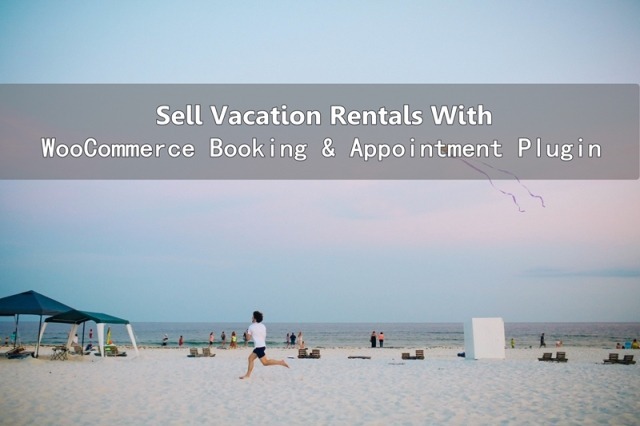 After reading this article, you will be able to know how to sell vacation rental using WooCommerce Booking and Appointment Plugin that focuses on fixed booking periods. 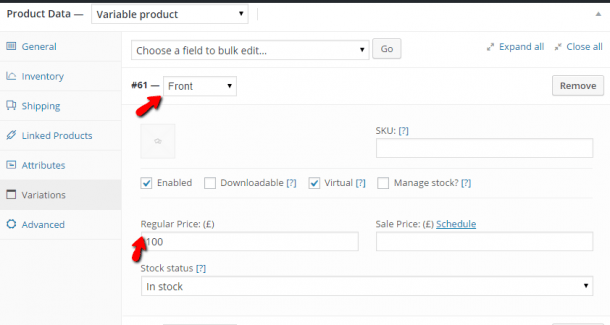 You must create your rentals as a new product in WooCommerce by clicking Products then Add Product link. 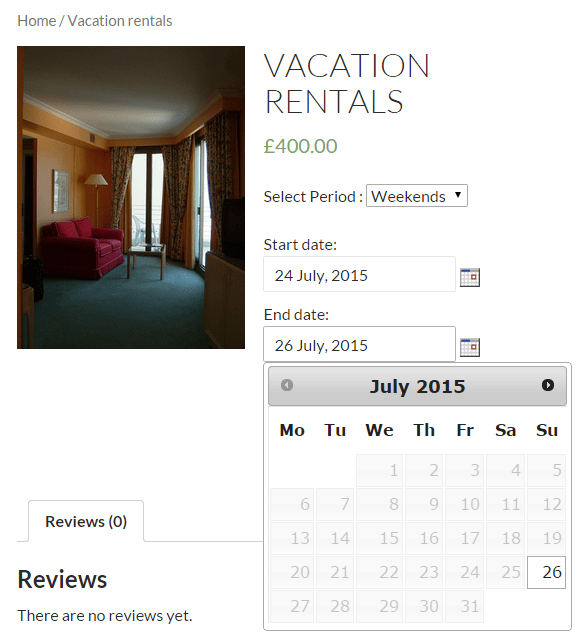 The Booking meta box allows you to setup your rental home which can be found on the same page. Based on the screenshot, the booking date and multiple day booking options were enabled in order for the user to select a start date and an end date. The Lockout date after X orders option is set to 1 which means once the house is booked by a customer, those dates will unavailable for further bookings until that customer checks out. 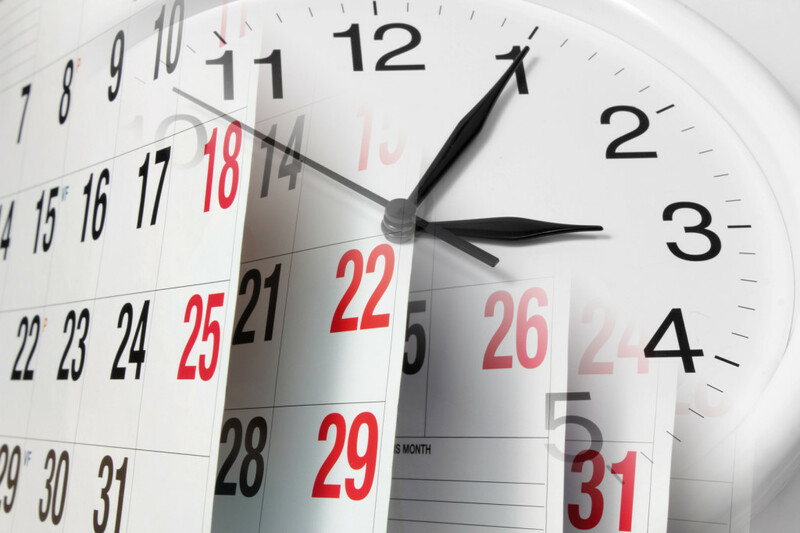 The WooCommerce Booking and Appointment Plugin allows you to specify the number of hours in the Advance Booking Period field under the Bookable Time Period tab. On the screenshot, it was set to 24 hours which means booking can be done only 24 hours prior to the start date or checkin. The Number of Dates to choose will determine the maximum number of days from today which you want to allow booking for. It was set to 365 days which means the calendar will have dates for a year from today to choose from. Check the Enable Fixed Block Booking option under the Fixed Block Booking tab to setup vacation rentals of fixed booking periods. This tab allows you to create multiple bookable blocks of varying periods. Click on Add New Booking Block button to add a new block where you will be able to create only one block at a time and save it. By saving, it will show the block details right below in the Booking Blocks table. On the screenshot, two fixed blocks were created, one for weekends and another for weekdays. In the Start Day and End day fields, there is an option called Any Days. You can select a specific weekday on which you want your block booking to start or you can choose Any Days so that your booking can begin on any weekday. 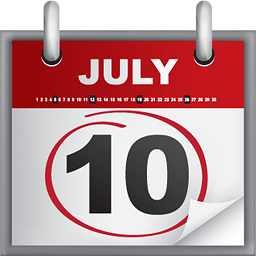 The end date or checkout date shall be populated based on the Number of days for that block. Weekdays booking can be done from Monday to Wednesday and Thursday as checkout day. Weekend booking can be done from Friday to Saturday and Sunday as checkout day. 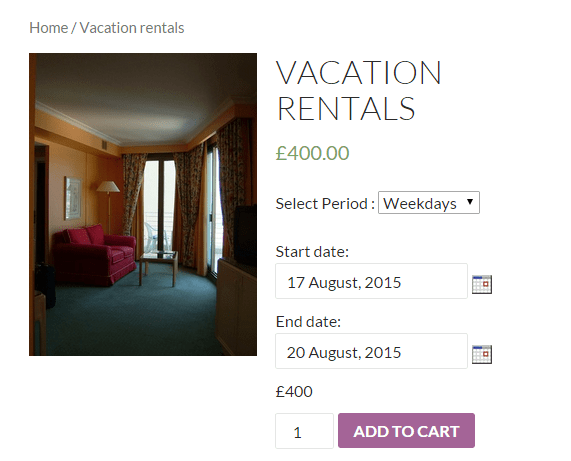 The Weekdays and Weekends vacation rental booking costs £400 and £600 respectively. Since this is a Simple Product, you just have to enter the basic details like Regular price and Sale price. 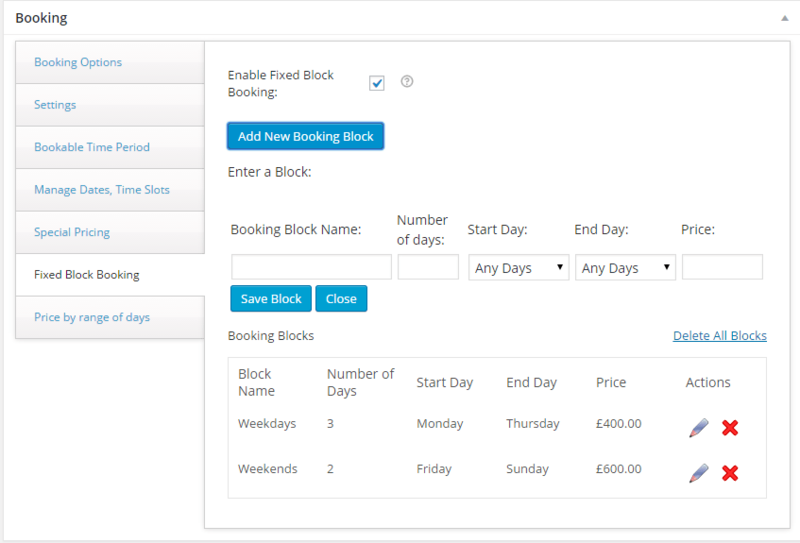 The price was set to £400 for the booking fields and the first block that shall appear is Weekdays by default. Once these settings are done, your frontend would appear as shown below. The Weekdays block would appear like this. The Weekends block would appear like this. In both cases, only the Start Day will be shown as enabled in the Start Date calendar. The available dates in a week and the user will be shown and have to select one according to his/her plans. The Add to Cart button is visible once the start and end dates were selected. By clicking on that button, the order is added to your cart and the View your Cart button is already there. 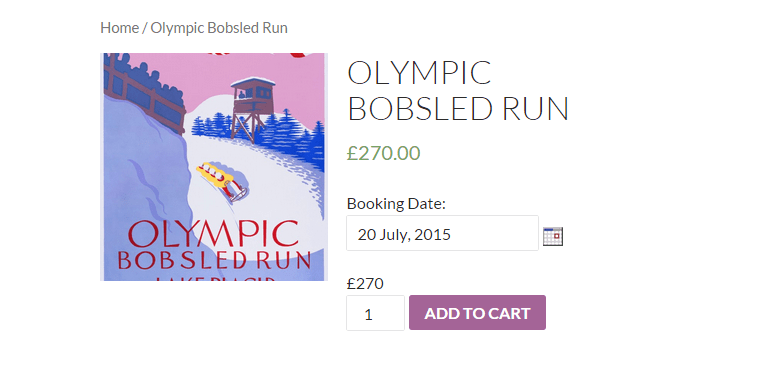 When you click the View your Cart button, you will see the booking details to the cart page. 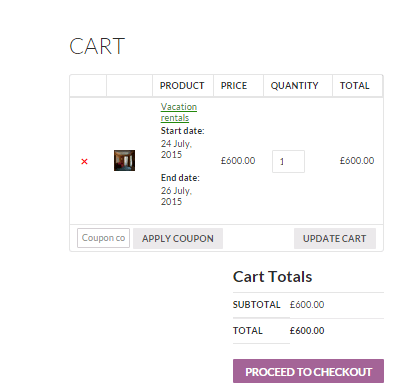 On the cart page, you can click on Proceed to checkout button to go to the checkout page. 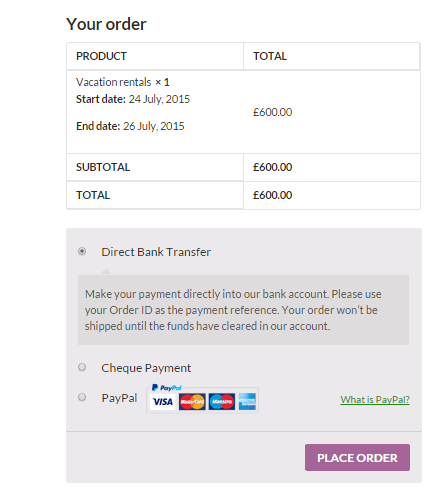 The checkout page will show the booking dates you have chosen and the total amount of your order. Place your order and ensure that you have checked everything and then click on the Place Order button. Once you are done placing your order, the order details are shown on the Thank Your page. Email notifications are sent to the customer and the administrator including the rental booking details. This setup would take 10 to 15 minutes if you are doing this for the first time. 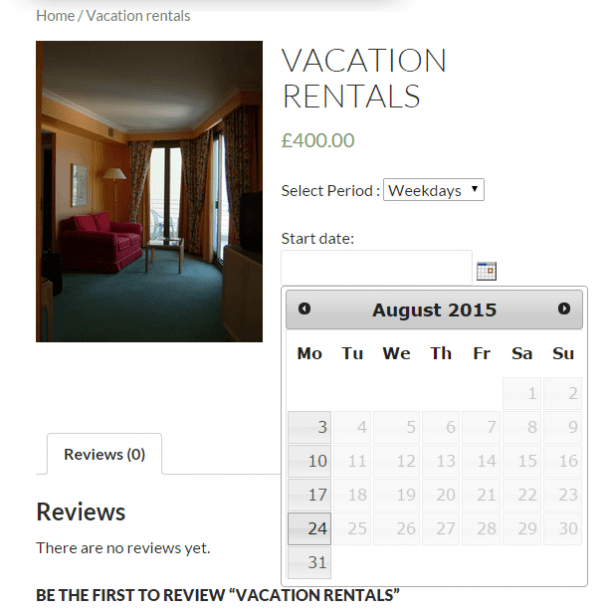 You can purchase the WooCommerce Booking & Appointment Plugin here. 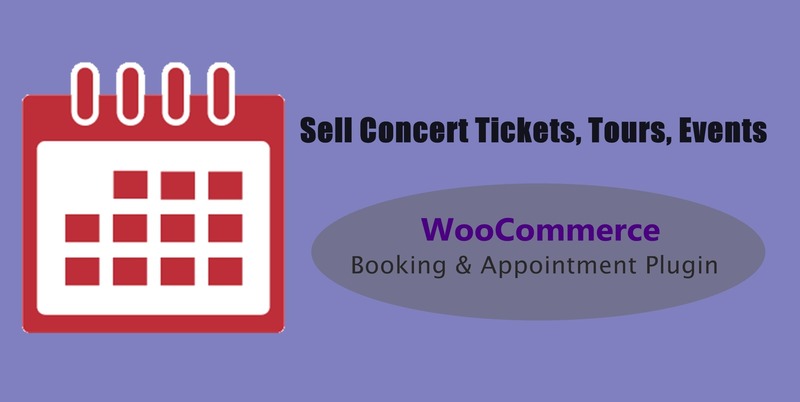 In this article, we will teach how to sell Concert Tickets, Tours, Events using the WooCommerce Booking & Appointment plugin with WooCommerce and WordPress. This plugin allows you to create booking and appointments for many activities before the scheduling. Since concerts happens on specific dates, we only need to enter the specific dates booking setting where the concert is to take place. The Lockout Date after X orders settings lets who set the maximum number of tickets that are available for sale for each date. 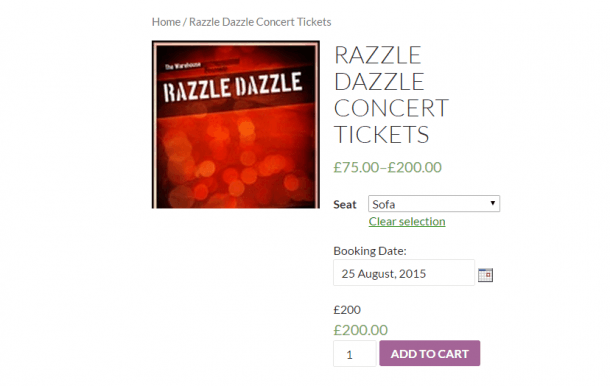 If the tickets are booked, the date will automatically be unavailable for taking any further ticket bookings. The next thing is to give users a choice for seat. 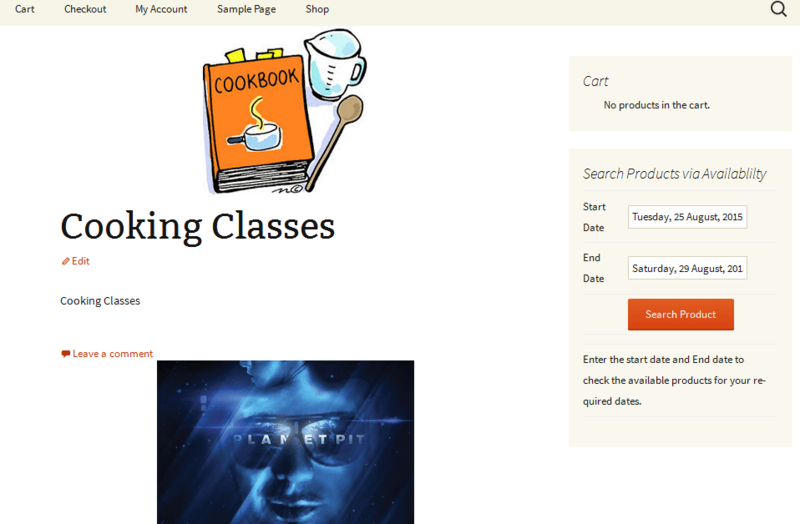 In the WooCommerce Booking & Appointment plugin, you can set the product as a Variable Product and add the necessary attributes and WooCommerce variations to it. 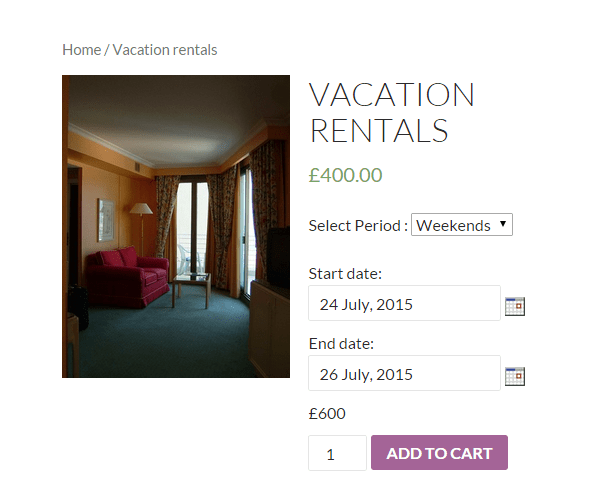 WooCommerce Variable product is helpful which can be used for hotel bookings. You can add fields like number of adults, number of kids, and etc. There are four (4) types of seats added: Front, Top, Botton & Sofa. Enter them in the Values(s) field and if it’s already saved, go the Variations tab to add the price for each seat type. Once published, this is how Concert Product would appear. 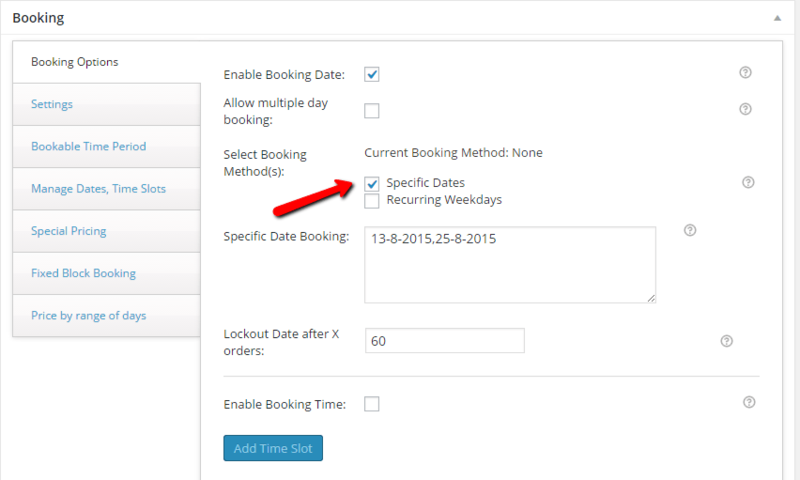 First, you need to select Enable Booking Date and select booking method as Recurring Weekdays. Then, select all the weekdays when the tour will be available and you can add the weekend price from the Special Pricing section. The Lockout Date after X orders setting works the same as describe above. The case of screenshot below, the weekend price was set to $150. Select the day and enter the price for that weekday and click on Add Special Booking. From the Regular price or Sales price fields in WooCommerce, the price for other regular weekdays was set to $100. If the Tour product is saved with above settings, you will be able to see the original price was displayed as $100. 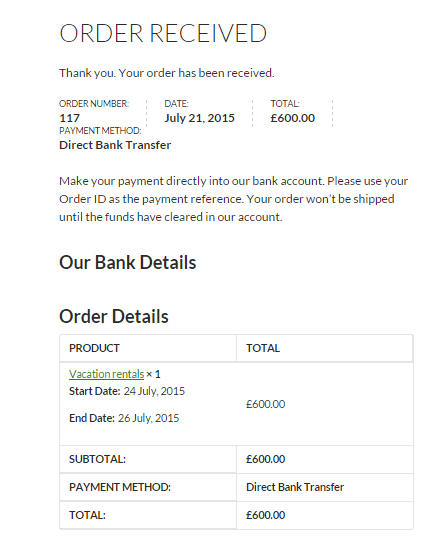 By selecting 27th June 2015, Saturday, it will charge $150 for that date instead of the regular price of $100. This will takes three (3) minutes to set up. In selling any event with WooCommerce Booking & Appointment plugin will take place on particular days just like selling concert tickets. On the screenshot, the user selected 20th July from the two dates for the event where user can select anyone from both choices depending on his/her convenience. This will take three (3) minutes to setup. If you like the plugin, you can purchase it at Tyche Softwares. 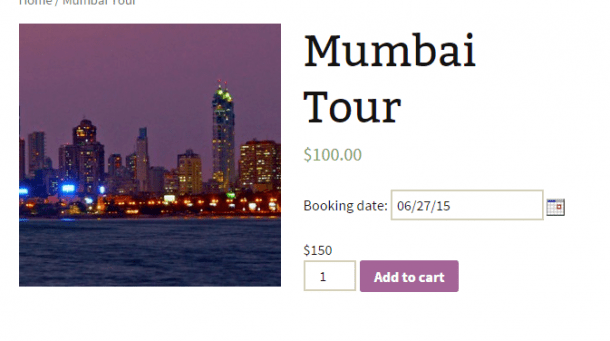 In this post, we are going to discuss on how to setup WooCommerce Booking Availability Search widget with screenshots using the WooCommerce Booking and Appointment plugin. WooCommerce Booking Availability Search widget allows you to search products as per their availability that has two fields. You can see which products are available on your store and the search result will display a list of all the products which are available. You will find the WooCommerce Booking Availability Search widget by going to WordPress Appearance > Widget menu. By adding different labels to the widget fields, it has five different fields which can be labelled. These are the Title for the widget area, Start date, End date, Text on the Search button and a textarea where you want to add any note in order for your customers to see. You can add the widget in any of the sidebars available on your site. By clicking WordPress > Appearance > Widget menu, it will be listed the entire sidebars list available in your theme. You are allowed to select any one of them, set the labels for the fields and the widget will be ready to use. As a result, once you search for any date or a date range, only that products which are available for that particular date or for the entire date range will be listed on the shop page. That product will have the searched date pre-populated in the Booking fields if you select any product from the search result. 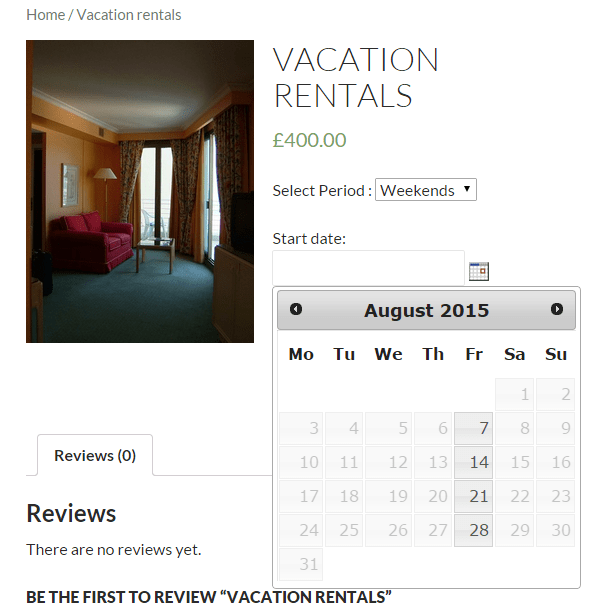 Browse the WooCommerce Booking and Appointment plugin with its features. In this article, we are going to explain to you how to setup delivery date and time settings for different shipping methods using the Order Delivery Date Pro for WooCommerce plugin. 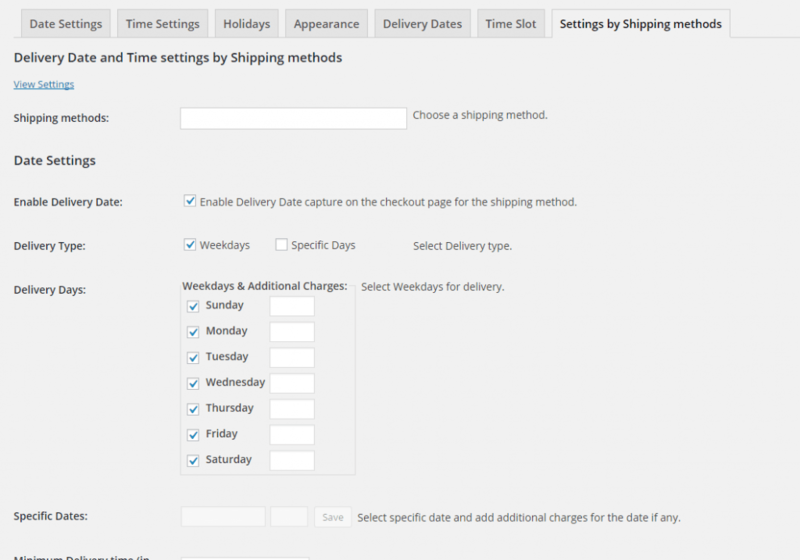 It enables you to create different delivery date and time settings for each of the enabled shipping methods on your WooCommerce store. Let’s get started in setting it up. In configuring the settings for different shipping methods, you need to go to Order Delivery Date > Settings by Shipping methods tab in admin. First thing to do is to select the Enable shipping methods based Delivery Date and Time Settings checkbox which helps to identify if the delivery date and time settings for different shipping methods is enabled or disabled. Then, if you’ve selected the checkbox, click on Save Settings button to enable the delivery by shipping methods. You need to click on “click here” link in the note and will redirect you to the page to add the delivery date and time settings for your shipping methods. In this page, it merges all the settings on the individual settings tabs and they are separated into different sections for each delivery type. From the Shipping methods drop down, you must select the shipping methods which settings needs to be made and you have the option to select multiple shipping methods. Select the settings for the above shipping methods from individual section and click on Save button located on the Add page. If the settings are saved, they will be displayed under Settings by Shipping methods tab. On the edit settings for shipping methods, you can click on the edit icon under the Actions column in the table of the settings displayed on the tab and will redirect you to the page to add the settings for shipping methods. On the delete settings for shipping methods, you can click on the cancel icon under the Actions column in the table of the settings displayed on the tab to delete the already added settings. There will be a confirm box to delete the setting. 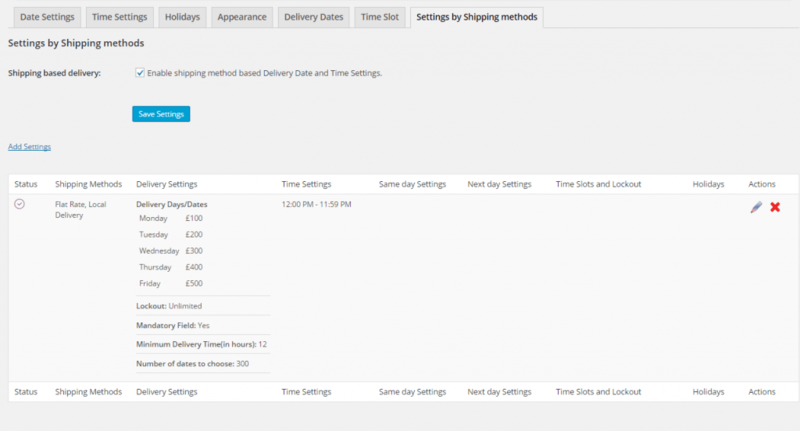 Take a look at the Order Delivery Date Pro plugin. 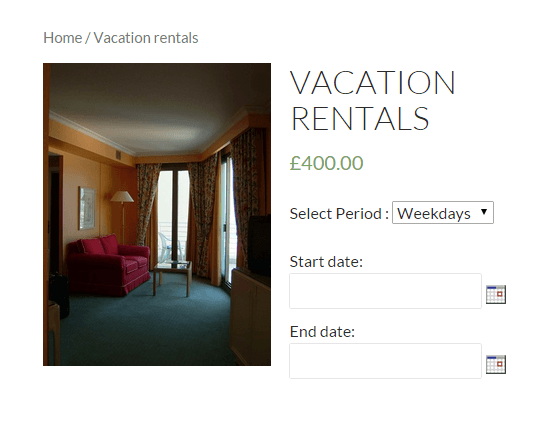 In this article we are going to show you the steps on how to change the booking rates for different seasons with the WooCommerce Booking & Appointment Plugin. First step is to create your product in WooCommerce by clicking the Product -> Add Product where you will find a Product Data metabox. You can now set the regular price of your product below it. Second step is to setup your booking options for the hotel rooms using the Booking metabox on the same page. You can enable the booking date and multiple day booking. 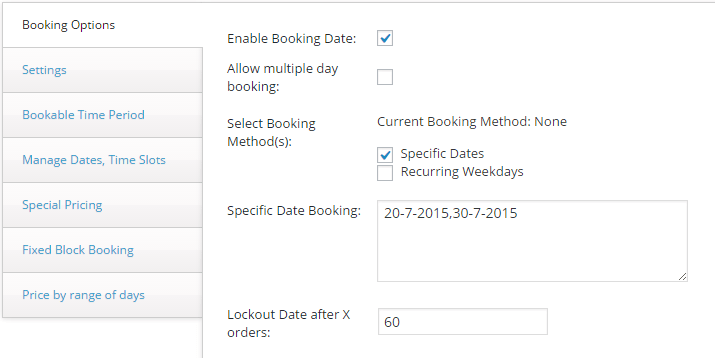 You can also set a limit using Lockout Data after X orders field that block the booking once it reaches the maximum. Third step is set the advance booking period under the Bookable Time Period Tab. By setting it, there are no last minute reservations for the product and the earliest booking can be done prior to the booking date. The Number of Dates to choose will set the maximum number of days such as for a month or year. Fourth step, under the Booking meta-box, a new tab will be visible once the Seasonal Pricing addon is activated. Go to the said tab and enable seasonal pricing where you will see a “Add new season” button, click on that and fill in the number of fields. Seasonal pricing addon allows you to create a new season and set higher or lower prices. There are two techniques to set the prices, the Seasonal Pricing Percent and the Seasonal Pricing Value. 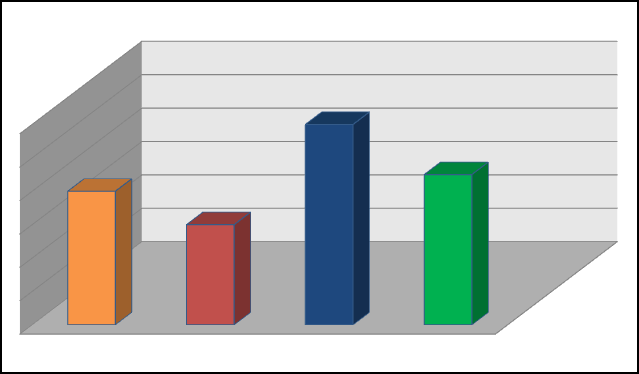 By enabling the Seasonal Pricing Percent, it will calculate the new rate by adding or subtracting on per day basis of the percent. By enabling the Seasonal Pricing Value, it will calculate the new rate by flat addition or subtraction of the amount entered to the original rate. It is easy and simple to setup which will take around 20 minutes to be completed. You can check it here the user experience that has screenshots provided by Tyche Softwares.